ROM Hacks: Claus is back, and better than ever! Mother 3 Claus's Journey v1.04 release! Hello again RomHacking.net! Claus is back, in an updated, finalized hack of Mother 3! In this hack, the roles of main characters Lucas and Claus are swapped, making Claus into the main protagonist, which greatly changes the story due to Claus’s drastically different personality compared to Lucas. Much of the text and story is altered to better showcase Claus’s personality and thoughts, as well as how others react to him. There are 3 different gameplay versions, one normal version for those who want to play only for the story, one moveswap version that makes Claus the offensive PSI user and KUmatora the defensive/healer, and a combined PSI that makes Claus and Kumatora's PSI movesets like Paula and Poo from Mother 2, where they both share good amounts of offensive and defensive PSI. All versions have Claus's instrument sounds changed too to be his actual instrument sounds, and not Lucas's. On top of that, the King Porky Statue boss fight has been altered to be winnable by normal means as he now has much more manageable HP and slightly nerfed stats, but he's still a big challenge (and as such, you can no longer one shot the boss with the New Year's Eve bomb). 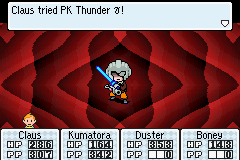 However, as a result the rewards for beating him are much greater, as you can get Lucas or Kumatora's Ultimate Weapons from him, as well as making the EXP for beating him slightly greater. If you already happen to have one of these Ultimate weapons, you can now sell them for a lot of DP as compensation as well. Re: ROM Hacks: Claus is back, and better than ever! Mother 3 Claus's Journey v1.04 release! I like this. 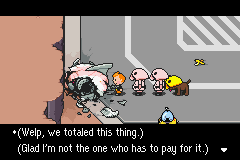 Played mother 3 many times, interesting to play it from Claus's perspective. Well grafted hack. Thank you, it's greatly appreciated. Very glad you enjoyed it man! Yeah, it's interesting seeing how things would go from Claus's perspective, I put a lot of effort into the hack and I'm glad you had fun with it!